This page is from a former STEVENS Bikes model year (2018). These pages are meant as a service in case you have questions about equipment and geometry of older STEVENS bikes. You can pick other model years at Service – Product Years. Unsere Website ist für die Nutzung von Cookies optimiert. Wenn Sie mit der Verwendung von Cookies einverstanden sind, klicken Sie bitte auf „OK“ oder surfen sie einfach weiter. Einzelheiten über Cookies und wie wir sie verwenden, erhalten Sie in unserer Datenschutzrichtlinie. Here you see a suggested frame size matching your step length. This is only a first clue. Please consult your specialist dealer and do a test drive. 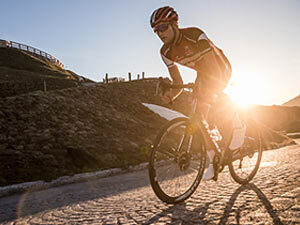 We have refined our top-of-the line aluminium cross bikes for you to compete with more speed AND control. The new full carbon fork with tapered steerer 1.5"!) easily handles any force caused by flatmount disc brakes and now can even be retrofitted with mud guards. The completely new Ultegra Cyclocross 11-speed drivetrain always keeps the wheels rolling - Fulcrum wheels, securely fastened with thru-axles and shod in Schwalbe X-One All-round tires. This versatile machine will get you to the finish line faster, safer, lighter. Brake later - stay fast longer. Perfect modulation with less hand force. Bietet optimale Voraussetzungen für bissige Scheibenbremsen an einer ultraleichten Rennmaschine. Lightweight plus knife-sharp steering precision and effortless climbing. Smooth welds reduce notching and make aluminium frames more durable. Increases riding comfort and provides stiffness and drive-train efficiency. For light and stable frame: Frame tubes with thinner walls in the middle and thicker walls at the ends. Riders benefit from noticeably higher steering precision, almost without weight penalty. Was bei den Profis noch umstritten ist, davon können Fahrer eines STEVENS Arcalis, Aspin, Comet oder Ventoux DISC schon heute profitieren: hydraulisch betätigte Scheibenbremsen, die sich bei minimaler Handkraft perfekt dosieren lassen – auch und gerade bei Nässe, wenn ihre Bremskraft kaum nachlässt. Das ist in heiklen Situationen im Straßenverkehr ebenso von Vorteil wie auf einer rasenden Passabfahrt in den Dolomiten. Oder auf den Cross-Kursen, auf denen es gilt, möglichst lange schnell zu bleiben. Der neue Montagestandard an allen STEVENS Disc-Rennern und Cyclocrossern nennt sich übrigens Flatmount. Mit ihm lassen sich die Bremszangen noch näher und eleganter an Rahmen und Gabeln platzieren als bislang. Das spart Gewicht, ohne dass darunter die Performance leidet. Und es sieht auch noch besser aus. 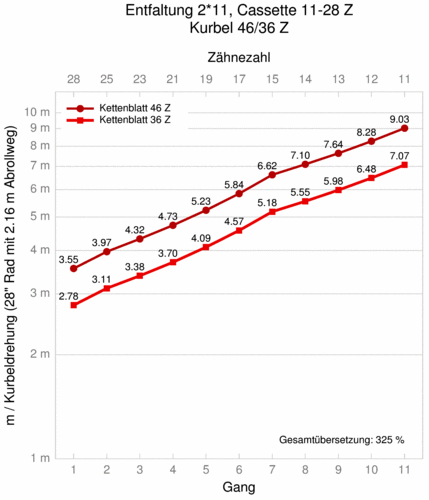 Gerade an einer ultraleichten Rennmaschine müssen bissige Scheibenbremsen die optimalen Voraussetzungen vorfinden, um ihre Qualitäten in jeder Fahrsituation voll ausspielen zu können. Also sind Rahmen und Gabeln unserer Disc-Renner mit maximal sicheren 12-mm-Steckachsen ausgestattet. The most intelligent way of lightweight design for STEVENS engineers is to use carbon forks with 100% carbon fibers that run all way though from dropout to steerer tube in one single piece. This results in an amazing riding experience on and off-road: Lightweight, knife-sharp steering precision effortless climbing and maximum lateral stiffness even when combined with disc brakes. Additional step in welding. The first, rippled weld, typical for aluminium, is covered with a second smoother weld. This not only improves looks but also lowers the risk of notches in this spot, which makes the frames more durable. The seat tube tapers from top to bottom. At the top it fits a slim 27.2mm seatpost that offers some flex and therefore increases comfort especially when riding over rough ground. At the bottom the large diameter nicley flows into the bottom bracket shell and downtube to provide great stiffness and drivetrain efficiency. Meaning a frame tube has three or two different wall thicknesses along its length. Triple butted (TB) is the usual technology with STEVENS high-quality frames. Tubes with different wall thicknesses are optimally adjusted to certain ways of manufacturing or to withstand specific loads. Where the highest loads occur or where tubes are welded, walls are the thickest. Butted tubes allow frame weight to be lower by several hundred grams. Fork shaft (or steerer tube) and head tube are tapered, meaning their diameter increases from top to bottom resulting in a conical shape. The diameter needs to be bigger at the bottom since this is where higher stress is applied. Riders will benefit from a noticeable higher steering precision almost without weight penalty. Also tapered steerers feature a smoother force transfer (like forces caused by hard braking) to the downtube than forks with a continuous 1 1/8" diameter. Tapered Steerer 1 1/8" - 1 1/2"
STEVENS Race Taper 1 1/8"-1 1/2"
Conclusion: The Vapor is proof of Stevens’ vast experience in the sport of Cyclocross. It’s a very well-balanced fast race bike with well-chosen specs for a fair price. The Vapor scores with secure handling and long-distance capable rider position. Shod with slicks this is a ca-do-it-all bike. The specs and the frame set are a great bang-for-the-buck package. De STEVENS Vapor biedt een zeer goede prijs-kwaliteitverhouding. De fiets is altijd betrouwbaar en overtuigt met uitstekende rijeigenschappen. Een volwaardige racefiets voor de winter. 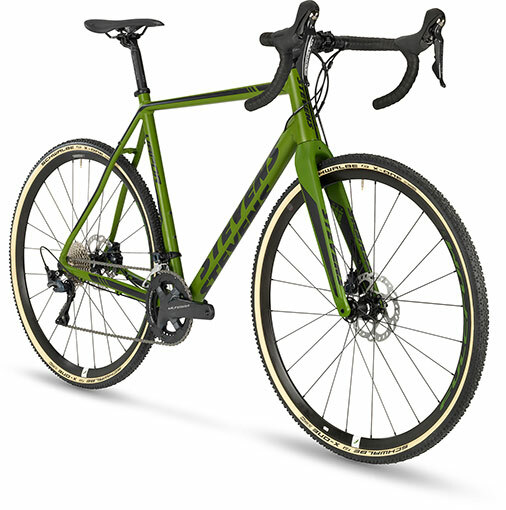 This category describes STEVENS cyclo-cross bicycles. They have 28-inch wheels with narrow tyres. The tyre width is 28 to max. 42 mm. STEVENS RACE Cyclo Cross. The permissible overall weight (rider incl. baggage and bicycle) should not exceed 115 kg. Under certain circumstances the permissible maximum weight can be further limited by the component manufacturers’ recommendations for use. 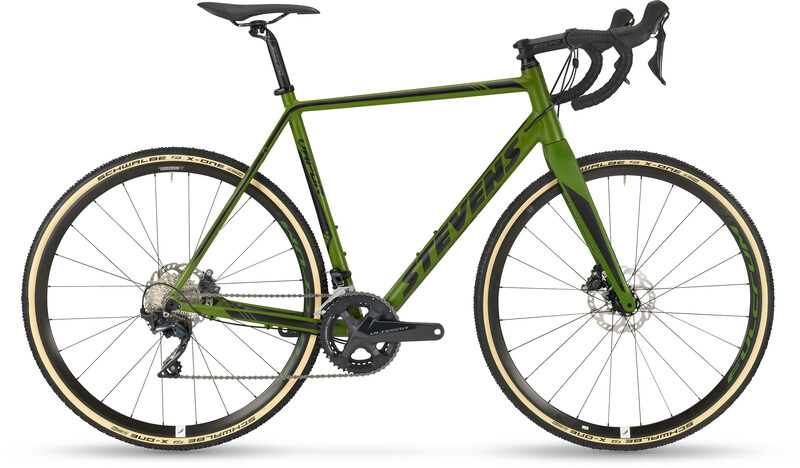 STEVENS cyclo-cross bicycles are intended for hard-surface terrain, i.e. for tarred roads and bicycle lanes or gravel field tracks, where the wheels do not lose ground contact. In addition, they are well suited for well paved gravel paths and forest roads as well as off-road trails with a slight slope where a temporary loss of tyre contact with the ground due to small steps may occur. They are suitable for use on easy terrain and cyclo-cross competitions, however not for off-road use (mountain bike use), namely for all mountain, enduro, downhill (DH), freeride, dual slalom, downhill/freeride parks, jumps, drops and in bike parks etc. Due to their design and fittings, STEVENS cyclo-cross bicycles are not always suitable for being used on public roads. If you want to use them on public roads, these bikes must be fitted with the prescribed equipment. Observe the traffic rules when riding on public roads. For more information see chapter “Legal Requirements for Riding on Public Roads” in your comprehensive STEVENS user manual on the enclosed CD-ROM. 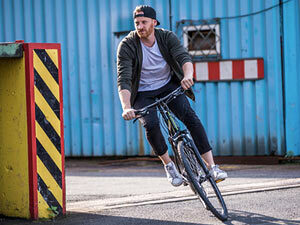 STEVENS bicycles of the category 3 are not suitable for off-road use over challenging and blocked terrain, jumps, slides, stair riding, stoppies, wheelies, tricks etc. !